As one of the world’s most modern nations with one of the world’s most impressive mass transportation system, the Japanese train system is something pretty much any modern country would want to emulate. Except for one aspect. While the Japanese trains are normally very punctual, Japan has one of the highest suicide rates in the world. Normally these two things wouldn’t be related, except that in Tokyo the easiest way to end your life is to step off the platform in front of a moving train. This kind of thing tends to seriously delay the morning commute, so the Japanese rail industry is using depression-fighting blue lights in an attempt to curb jumpers. In theory, any thing you can do to defy death is a good thing. There are already anti-suicide barriers in more popular train stations throughout Japan. There’s not a lot of evidence that the blue LED lights will convince a jobless salary man from leaping to his death, but any little bit helps. Blue lights are purported to have a calming effect. I guess because Kmart‘s old Blue Light Special always used to mean special deals for the consumer? Or maybe people just really like blue? I guess this is a good real-life test for the theory. 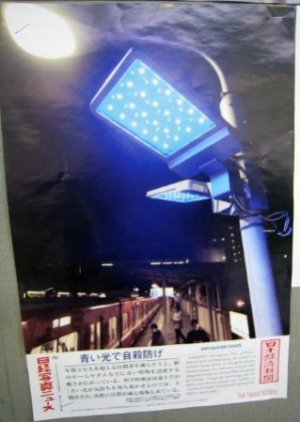 Blue lights made their debut in certain locations way back in December 2006, and are expected to be installed in all of JR East‘s stations by the end of October. If they work, I’m sure we’ll be seeing blue lights on every popular suicide bridge and subway platform throughout the world. A pack of new light bulbs is a whole lot cheaper than cleaning up a mangled corpse.